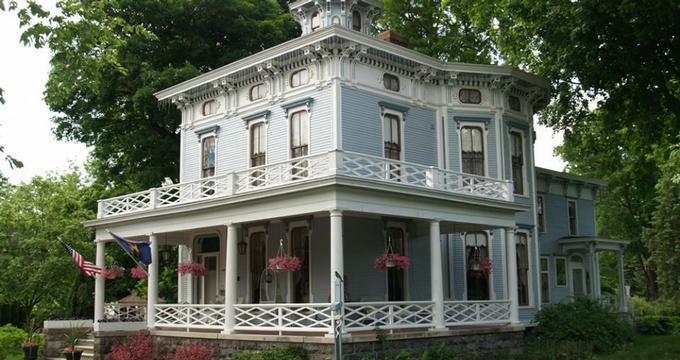 The Delano Mansion Inn and the Historic Allen House is a charming Southwestern style bed and breakfast in Allegan near Lake Michigan. Built in 1863, the DeLano Mansion Inn features beautifully appointed accommodations in two historic houses, the Delano Mansion Inn and the Allen House, which is located next door. Both abodes feature beautiful decor and period furnishings, private dining rooms and parlors in which to relax and inviting spaces for private events and functions. 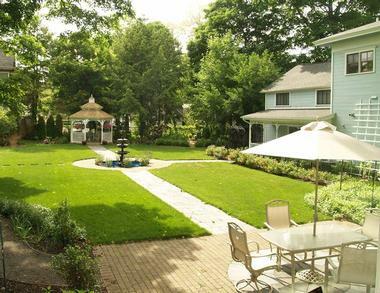 Both the Delano Mansion Inn and the Historic Allen House are ideally located for exploring the area, are close to the town of Holland and Saugatuck and an array of outdoor activities and attractions to explore and enjoy. The Delano Mansion Inn and the Historic Allen House offer beautifully appointed accommodations in two historic mansions located next door to each. The Delano Mansion Inn features four luxury suites and two guest rooms with private bathrooms and spacious sitting areas, a private dining room on the first floor and two parlors in which to relax over a cup of coffee. 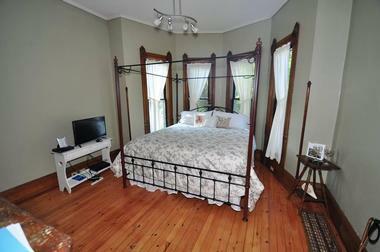 The historic Allen House also offers six charming guest rooms with private bathrooms and lovely views of the gardens. All guest rooms are comfortably decorated with country-style decor and period antiques and enjoy private en-suite bathrooms with showers/baths, luxury conveniences, and modern amenities. Such amenities include large flat-screen LCD/TVs with DVD players, cable television, mini fridges and coffeemakers, individual climate control, gas fireplaces, hairdryers, and complimentary wireless Internet. Guestrooms and suites feature queen or king-size beds in luxury linens, wooden floors with plush carpeting, spacious en-suite bathrooms with showers/baths/double whirlpool tubs (suites), single or double marble-top vanities, makeup mirrors, fresh towels and bathrobes, and deluxe bath products. Rooms and suites have spacious sitting areas with antique tables and comfortable chairs and large windows overlooking the gardens. 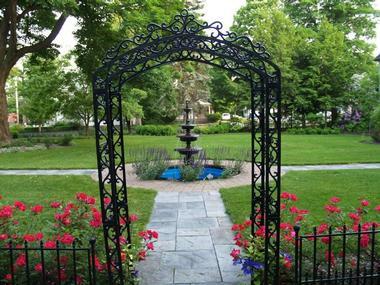 The Delano Mansion Inn offers the French Garden Suite, the Davis Suite, the Delano Suite, the Parsonage Suite, the Chaddock Room, and the Ashley Room, while the Allen House features the Michigan Room, the Allen Room, the Sherwood Room, and the Moore, Margarite and Allegan Rooms. Guests at the Delano Mansion Inn and the Historic Allen House enjoy a complimentary breakfast every morning in the private dining room overlooking the gardens or a light continental delivered to the chambers. The traditional breakfast includes fresh fruit juices, tea, and coffee, followed by seasonal fruit bowls, freshly baked bread and pastries, and a variety of hot entrees including omelets, sausages and more. Lighter continental breakfast consists of freshly brewed coffee, tea, and juice, muffins, fresh fruit and yogurt delivered to the guest rooms, while Breakfast-on-the-Go is available for guests with an early start. There is an array of dining options for lunch and dinner within a short walk or drive from the Inn, ranging from fine dining fare to casual cafe cuisine. The Delano Mansion Inn and the Historic Allen House offer an array of amenities to enhance every guest's stay, including luxurious accommodations with modern amenities such as individual climate control, cable television, and complimentary wireless Internet. A delicious breakfast is served every morning in the dining room or delivered to the guest rooms and two comfortable parlors in the Delano Mansion Inn are ideal for relaxing and socializing. The Delano Mansion Inn offers a variety of special packages for all occasions from weddings and elopements to spa and pampering weekends and wine-tasting adventures. Voted as one of the 'coolest small towns in America,' Allegan is a quaint and charming town set along the banks of the Kalamazoo River in Michigan. Although small, the town has much to offer in the way of things to see and do and attractions and activities to enjoy from shopping and dining out to theater performances, art galleries, wine-tasting, and more. Located just a few blocks from the vibrant downtown area of the town, DeLano Mansion Inn is ideally placed for exploring all that the little town has to offer. Slightly further afield there are miles of beautiful beaches in West Michigan and the towns of Douglas, Holland, Saugatuck, and South Haven are a short drive away. Outdoor activities range from hiking, mountain biking, golfing and fishing in the summer months to skiing, snowboarding, and cross-country skiing the winter. Year-round activities include wine tasting, antique shopping, gallery browsing, and dining out. The Delano Mansion Inn and the Historic Allen House make the perfect venues for special occasions such as weddings and elopements and offers a variety of packages to suit every need. The Elopement Package includes accommodation in one the Inn's luxury suites with a double whirlpool tub and gas fireplace, complimentary flowers for the bride and groom, and a wedding officiate and witnesses for the ceremony (if required). Also included is traditional wedding music, a photography session, a dinner voucher for two, chocolate and a bottle of Champagne, a custom designed wedding cake, and a candlelit breakfast for two.